The Multiwheel Colour window lets you select and customize colours, create solid or gradient colours, store colours in the colour storage library, open the Colour Picker window and undo actions. For tasks related to this dialog box, see About Colour, Creating Gradients and Using the Edit Gradient - Texture Tool. The Multiwheel Colour window opens. Opens the Colour Picker window—see Colour Picker Window. Displays the current colour on the left side. On the right side is the currently you are modifying. Displays the colour gradation of the colour selected in the colour picking area. Displays a colour range with a cursor which you can drag to select a colour. This display changes when you select one of the these options: H, S, V, R, B, or B. Lets you select a colour from any place on your screen. Hold down the Dropper and drag to the desired colour and release to select the colour. 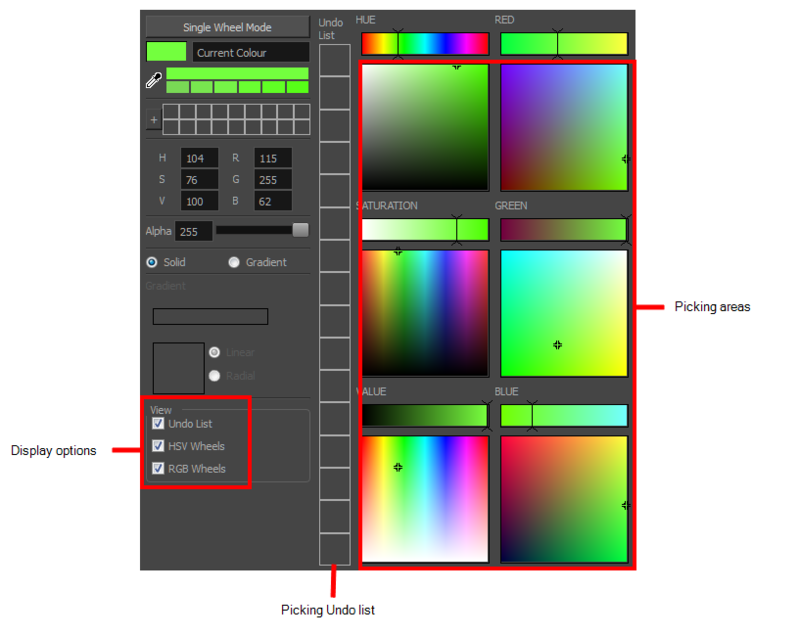 Displays the hue selected in the colour picking and colour slider areas, and its different values. Adds the selected colour to the colour storage library. Lets you save colours you have defined. Lets you change the transparency level by typing in a value or dragging the slider. Creates an even, uniform colour. Lets you create a linear or radial gradient—see Creating Gradients and Using the Edit Gradient - Texture Tool. Displays a colour range and arrows. Move the arrows to define the gradient colours. Displays a preview of the gradient as you move the arrows on the gradient scale. Creates a radial (circular) gradient. Shows or hides the Undo list. Shows or hides the HSV colour wheels. Shows or hides the RGB colour wheels. Displays a list of actions you can undo by clicking a swatch in the list. Displays the hue, saturation or value of a selected colour in the colour picking area. Displays the red, green or blue colour wheel.